Humphrey, the classroom hamster, is back, this time in a new series for chapter-book readers. Newly-independent readers are in for a treat with these stories of Humphrey’s adventures on the weekends. Each Friday afternoon, the suspense builds for the little hamster hero as he finds out where his temporary home will be. In this first outing, Humphrey goes home with Mandy (nicknamed Don’t-Complain-Mandy-Payne) and makes friends with her pet hamster, Winky. 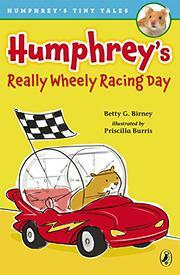 Winky has a hamster car, propelled by a plastic hamster wheel, and Humphrey is impressed. He loves his own little ball, but it’s not nearly as fabulous as Winky’s car. When Mrs. Brisbane buys a car for Humphrey, the class decides to have a race day—Winky versus Humphrey, and Og, the class frog, versus George, the frog from another class. In the second story (publishing simultaneously), Humphrey’s Playful Puppy Problem, Humphrey goes home with Richie, who plans to use Humphrey in his science experiment. Humphrey has to fend off a too-loving puppy called Poppy and fix the experiment when the pup’s exuberance proves to be too much for it. Birney has created the kind of series that first- and second-grade readers will love. It’s set in school, the vocabulary is accessible, the font and spacing are generous, and the frequent illustrations tie the story together.